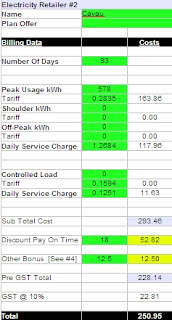 In the search for a better electricity offer for our own office, we decided to create a simple spreadsheet. This software allowing us to cut through all the marketing hype and compare apples with apples. Our satellite office had an electricity bill of $312 which we have now got down to $250. That is not a bad saving for a couple of hours investigation. If you too are also having problems cutting through the marketing hype of electricity retailer's offers, why not take a copy of our spreadsheet for test drive. You simply enter the details from your last electricity bill, including tariff rates and daily service charges and two other retailer's electricity offers. The software easily shows you the cheapest offer, allowing you also to include all discounts and bonus offers. The spreadsheet supports all tariffs, flat and tiered rates along with time of use and controlled loads. Now you can easily see who is charging what and where, importantly finding truly the best deal for your home. This spreadsheet is suitable for all of you trying to find a better electricity deal, no matter where you live. We will be adding this software to our website soon, but in the meantime why not give us a call on 02 8064 3992 to get your copy.